Objectives: Recent literature suggested that higher vitamin D concentrations in childhood are associated with a lower prevalence of molar incisor hypomineralization (MIH). 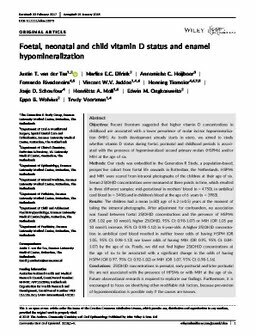 As tooth development already starts in utero, we aimed to study whether vitamin D status during foetal, postnatal and childhood periods is associated with the presence of hypomineralized second primary molars (HSPMs) and/or MIH at the age of six. Methods: Our study was embedded in the Generation R Study, a population-based, prospective cohort from foetal life onwards in Rotterdam, the Netherlands. HSPMs and MIH were scored from intraoral photographs of the children at their age of six. Serum 25(OH)D concentrations were measured at three points in time, which resulted in three different samples; mid-gestational in mothers' blood (n = 4750), in umbilical cord blood (n = 3406) and in children's blood at the age of 6 years (n = 3983). Results: The children had a mean (±SD) age of 6.2 (±0.5) years at the moment of taking the intraoral photographs. After adjustment for confounders, no association was found between foetal 25(OH)D concentrations and the presence of HSPMs (OR 1.02 per 10 nmol/L higher 25(OH)D, 95% CI: 0.98-1.07) or MIH (OR 1.05 per 10 nmol/L increase, 95% CI: 0.98-1.12) in 6-year-olds. A higher 25(OH)D concentration in umbilical cord blood resulted in neither lower odds of having HSPM (OR 1.05, 95% CI: 0.98-1.13) nor lower odds of having MIH (OR 0.95, 95% CI: 0.84-1.07) by the age of six. Finally, we did not find higher 25(OH)D concentrations at the age of six to be associated with a significant change in the odds of having HSPM (OR 0.97, 95% CI: 0.92-1.02) or MIH (OR 1.07, 95% CI: 0.98-1.16). Conclusions: 25(OH)D concentrations in prenatal, early postnatal and later postnatal life are not associated with the presence of HPSMs or with MIH at the age of six. Future observational research is required to replicate our findings. Furthermore, it is encouraged to focus on identifying other modifiable risk factors, because prevention of hypomineralization is possible only if the causes are known.